Now that the film has moved from the arcade to the internet, a world wide web of possibilities has opened up for the film. Aside from poking fun at some of the internet cultures most known jokes, there is a bombardment of product placement. Everything from eBay to Twitter to Spotify is on full display, but rather than seeming like a cash-grab (though it might be just that), it comes off as an authentic exploration of the internet’s most popular companies. There is even fun to be had with pop-ups in the film, which is probably the only time that pop-ups have ever been an enjoyable aspect of the internet. There are even a couple post-credits sequences to prove how much fun this film has recreating popular memes. Directors Phil Johnston and Rich Moore both take us into this visually intoxicating world, much like the colorfully sweet world of “Wreck-It Ralph”. 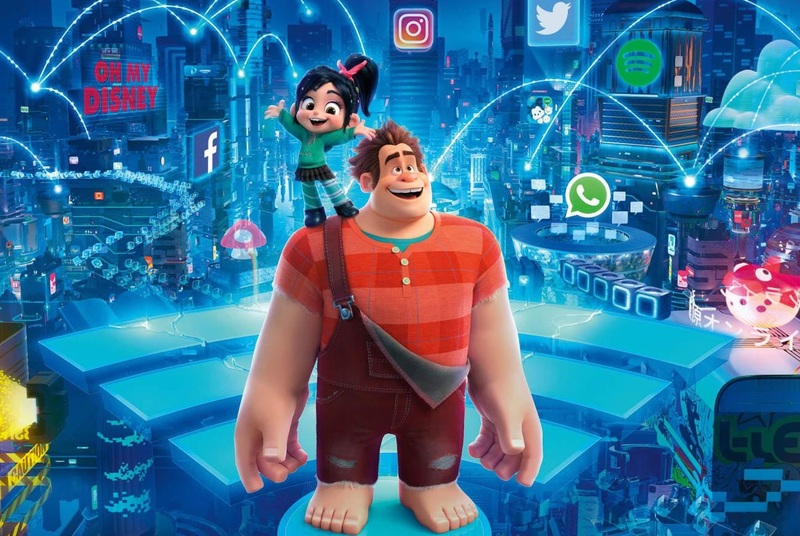 Much like the first film, “Ralph Breaks the Internet” takes visual cues from already visited visual representations of what the internet would look like if it were a metropolis. In the first film, Rich Moore played off of all of the visual styles of games that already existed, usually by adding another dimension. Together, Moore and Johnston use the same method of recreating online game worlds, but blend it with a “Zootopia” type landscape, complete with a seedy for the darknet that gives you “Star Wars” cantina vibes.